The Brooklyn Bridge has starred in countless television shows and movies set in New York City and is the subject of many iconic photos. But if you're visiting New York for the first time, how do you get to the Brooklyn Bridge? It's a valid question! New York City is big and sprawling. Most first-time visitors think of Manhattan and Times Square first, since they're the most recognizable parts of the city. Brooklyn is the most populous of New York's five boroughs, sitting to the southeast of Manhattan. The Brooklyn Bridge spans the East River and connects Brooklyn to the island of Manhattan. Where in New York is the Brooklyn Bridge? On the Brooklyn side, the Brooklyn Bridge is in two adjacent neighborhoods. One is called Downtown Brooklyn, and the other is called DUMBO (which stands for Down Under the Manhattan Bridge Overpass). There are two entrances to the Brooklyn Bridge, one in each neighborhood. On the Manhattan side, the Brooklyn Bridge is in Lower Manhattan, on the east side of the island. The Brooklyn Bridge is the southernmost of the bridges connecting Manhattan and Brooklyn. Others include the Manhattan Bridge and the Williamsburg Bridge. The Brooklyn Bridge is very close to and is visible from the neighborhood called Brooklyn Heights, but that neighborhood doesn't touch the bridge. This is a common mistake that newbies to the city make. How Long is the Brooklyn Bridge? When it was built in 1883, the Brooklyn Bridge was the longest suspension bridge in the world. It's about 1.1 miles or 1.8 kilometers long, and more than 10,000 pedestrians and over 5,000 cyclists cross the bridge on a daily basis. Your own walking speed and the number of other people on the bridge will determine how long it takes you to cross; many people who work in Manhattan walk across the bridge as their daily commute. It's also a popular option for joggers and runners. 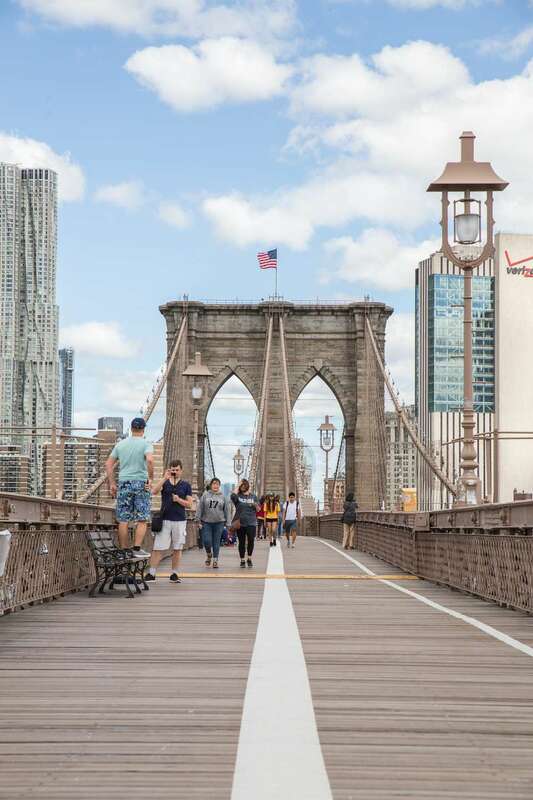 If you're planning to walk the bridge, give yourself enough time to take photos and to enjoy the spectacular view of the Manhattan skyline. Bring snacks and wear comfortable shoes, and take care that you don't venture into the bike lane. Cyclists go pretty fast across the Brooklyn Bridge and you want to avoid a collision. What are the Subway Stops Nearest the Brooklyn Bridge? From the Manhattan side, you can take the 4, 5 or 6 trains to the Brooklyn Bridge/City Hall stop or the J or Z trains to the Chambers Street stop. There are other options, but these two are closest to the bridge's pedestrian walkway. From the Brooklyn side, take the A or C trains to the High Street stop. The Brooklyn Bridge will be visible once you exit the subway, and there are signs that will point you to the pedestrian walkway on this side.